Browse: Home / 2016 / May / 01 / North Atlantic Heat Content Plunges… Meteorologist Warns Of “Serious Implications” On US Climate, Sea Ice! Paul Dorian of the excellent weather science site Vencore Weather here brings us up to date on the latest on one of the most powerful natural cycles driving our North Atlantic climate: North Atlantic sea surface temperature (SST) cycles. Here I’ll sum up the main points. Of course do read the entire post at Vencore for all the details. In a nutshell the sites writes that the North Atlantic “is now showing signs of a possible long-term shift back to colder-than-normal sea surface temperatures (SST) and this could have serious implications on US climate and sea ice areal extent in the Northern Hemisphere”. Global monthly heat content anomaly (GJ/m2) in the uppermost 700 m of the North Atlantic since January 1955. The thick line represents the simple running 37-month (c. 3 year) average. Data source: National Oceanographic Data Center (NODC), climate4you.com. Last period shown: October-December 2015. The next chart Vencore provides below is one of Atlantic sea surface temperature (SST) since the 1870s. Clearly we see that huge climate driver has been cyclic and that the past 20 years have been marked by very warm SSTs. Observed AMO index, filtered annual mean area-averaged SST anomalies over the North Atlantic basin (0N-65N, 80W-0E), using HadISST dataset (Rayner, et al., 2003) for the period 1870-2015.; courtesy NCAR: climatedataguide.ucar.edu/climate-data/-amo. Little wonder the North Atlantic region has been seen warmer than normal conditions over the past 2 decades. But that warmth appears to be waning as the North Atlantic is now heading toward its cool phase. That cooling down is confirmed by the Japan Agency for Marine-Earth Science and Technology (JAMSTEC). Note how the transitions take place quickly, in a matter of just a few years. Vencore writes that the North Atlantic cooling is likely going to have some “significant impacts on Northern Hemisphere (NH) sea ice areal extent over the coming decades“, and thus could be a major blow to climate science forecasts of a melting Arctic. If the North Atlantic cooling continues, then Vencore warns we should expect Arctic sea ice to return to 1990s levels, if not even greater. 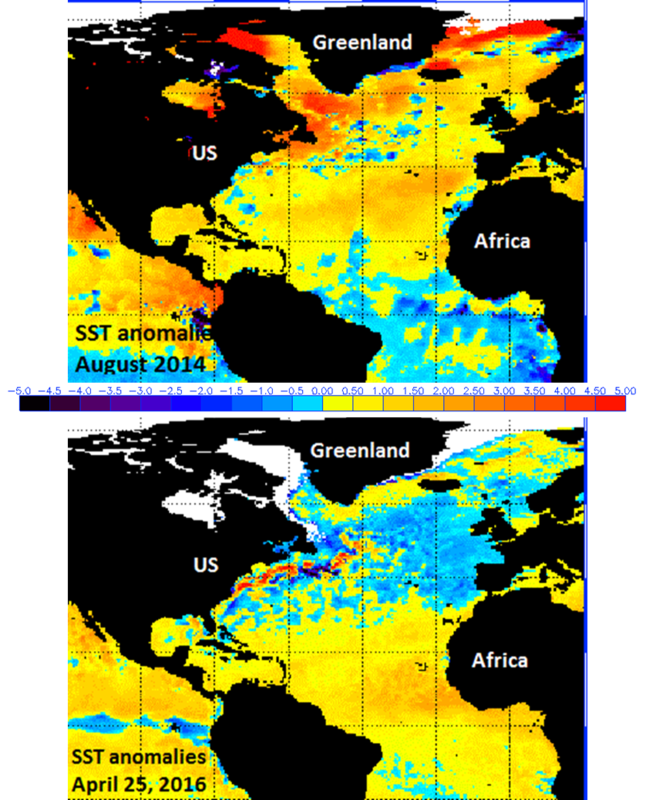 The cooling North Atlantic will also have serious ramifications for North America’s climate. Vencore reports that winters over large parts of North America are much colder during cool North Atlantic phases, and significantly warmer during the warm phases. So if these trends should continue, it means that the days of the global warming scare are numbered, or they will have to move to the other hemisphere. Modern Warming phase itself is also winding down since it has been around for about 320 years,which is near the average warm phase span of time. The Little Ice age did end about AD 1850, after the Dalton Minimum. Well, after the Maunder-Minimum, there was some warming between 1700 and the Dalton Minimum, but I don’t think you can add this time span to the modern warm period. The Dalton was not that big. The deepest minimum of the LIA should have been around 1750.
and if you say that WARMING is when something WARMS you gotta look back to the deepest temperature minimum. From where it warms. So, 1700, I’d buy that too. Serious implications? Nothing we haven’t seen before. The negative AMO also reduces the risk of Atlantic tropical storm development. That could have serious implications for Kerry Emmanuel and others who have been saying we’re in for more extreme weather. They’ll just have to endure winters like it’s the 1970s all over again…. Yes, and it could get to be extremely abnormally normal. How will we ever survive it?! Also – if the sun is really entering a quiet phase similar to the Maunder and other minimums that accompanied (contributed to?) the onset and maintenance of the Little Ice Age, we could be in for some serious trouble. Looks like the DMI’s new method of measuring Arctic Sea Ice didn’t go into effect any too soon. Now that they are masking out twice as much as is accumulating, they can still pretend it’s warming, and the ice is decreasing. The full cycle, warming phase plus cooling phase is around 66 years as it is with the PDO. The two previous warm phases had three and two warming humps respectively. I would assume that logically we could expect the current phase to be similar; particularly as the current warm phase has only lasted for about 55 years so far. However there is little doubt that the trend will be cooling over the next two decades. This theory has already been disproved. The global warming scare doesn’t need North Atlantic and it doesn’t need to move to the Southern Hemisphere, either. In fact, global warming doesn’t need the globe as such at all. Like plague, it can survive in a single metropolis or just one inner city for a while and then pop up somewhere else. It’s been observed to appear for one afternoon during global warming hearings in the United States Congress. It suddenly surfaced in Georgetown during President Obama’s climate action speech on June 26, 2013, forcing him to pause and wipe his brow every few minutes. The progressive teenage daughter of one of my neighbors experienced a sudden emergence of global warming in the front yard of their house and I know there were others, at different times. None of this matters, though. It is assumed that global warming doesn’t have to be observed and measured in any known physical location on Earth at all. It may exist in the middle of the ocean. It can hide at the bottom of the ocean or under glaciers and ice sheets. The fewer thermometers are around, the better. It likes to show us it doesn’t need them. We just need to know it’s there. Under the newest scientific proposals, it disappears the moment somebody tries to measure it and pops up somewhere else. Like quantum particles, it doesn’t like being looked at or pinned down and we can’t do anything about it. If it hears somebody talking poorly about it, global warming may withdraw and cocoon for while in the circuits of climate modeling supercomputers. While there, it will swell to double or triple its original size and regularly lash out to the pages of newspapers, onto evening news, social media and into climate change legislation. But normally, global warming is a cheerful and self-confident thing with a busy social life. It has places to go and people to meet. The idea that its well-being depends on the atmosphere, the oceans or other such pesky little things is totally preposterous. All it needs is to think of a little extra carbon and it’s off to the races. North Atlantic can go pound sand. I like it!!!.. Somehow I don’t suppose sod and buddy and co. will find your writings to be even slightly humorous! VERY INTERESTING. All that cooling since 2008 in the North Atlantic…..and the Arctic ice sheet is melting into oblivion. Oh…wait. We ARE at record low levels of sea ice for this time of year. I wonder how THAT happened with all that “cold water” from the North Atlantic? We recently had an El Nino, genius. Nobody cares what the ice does at this time of the year (as long as it isn’t too much). The minimum is in September. It will not survive the summer? Again?! Hey CW.. how many summers has it “not survived”? I think we have to go back to most of the first 3/4 of the Holocene probably the late MWP, just before the COLDEST period in the last 10,000 years.. It certainly “survived” during the LIA , which we have only just staggered out of… thankfully. Once that hits the Arctic, there is no chance at all of sea ice levels reaching anywhere near the ZERO summer levels of the first 3/4 of the Holocene. It looks like the recovery from the Little Ice Age and the peak in the AMO is over.